Preparing their economies for entry to the European Union is yielding dramatic results for accession candidates and providing inspiration for those that aspire to follow them. Kiev: Banking market set for sharp growth. While EU accession has already provided significant benefits to the 10 CEE countries that joined in 2004 and in January this year, it remains a beacon of hope for future EU candidate countries and hopefuls that are becoming more proactive in defining their national interests and embracing the principles of a market economy. For Croatia, the former Yugoslav Republic of Macedonia, Turkey and “potential EU candidates” such as the western Balkan countries of Albania, Bosnia and Herzegovina, Montenegro and Serbia, the prospect of EU entry is just as meaningful as it was for their predecessors, if not more so, given their turbulent histories. In the late 1990s, during the war that ravaged the former Republic of Yugoslavia, no one could have envisaged that a decade or so later countries like Croatia, Bosnia and Herzegovina would have been able to rebuild their economies from virtually nothing. But as Marcus Svedberg, chief economist, East Capital Asset Management in Stockholm, points out, the promise of EU accession is a powerful force for transformation—so much so that the pace of economic reforms among EU hopefuls and candidate countries is outstripping that in other parts of CEE. “While some of the more established CEE countries are suffering from reform fatigue, for the last two years Croatia, the Balkans and countries like Turkey, Ukraine and Georgia have been doing most of the reforms,” he says. As long as Croatia fulfills its economic and judicial reform obligations, it is expected to enter the EU between 2010 and 2012. Croatia has a stable market economy and relatively low levels of inflation, and in the first quarter of this year its economy grew by 7%, fueled by strong domestic demand. Heeding the lessons of its CEE neighbors, it has also tightened monetary policy to avert the risk of an overheating economy. For the other two candidate countries, however, EU accession is more problematic. Macedonia’s EU candidate status was approved in 2005, but formal negotiations have yet to commence. And while it has implemented multiple reforms, existing EU members Greece and Cyprus have threatened to veto its accession unless the issue of its name is addressed. In transition: Turkey's EU aspirations are driving dramatic changes. The other EU candidate, Turkey, has engineered a major economic turnaround with strong growth of 5% in real terms projected for this year, rising to 6.4% next year. The current-account balance has also improved, and in its July 18 CEE Biweekly, UniCredit described Turkey’s financial markets as “sparkling” on the back of strong demand from foreign investors, particularly in the banking sector, and an appreciating lira. Yet although everything may be moving in the right direction economically, political risks remain in terms of Turkey’s secular stance, one of the conditions of the Copenhagen Criteria for EU entry. In the run-up to July’s elections, which saw the AKP restored to power, AKP’s presidential candidate, foreign minister Abdullah Gül, was forced to withdraw his candidacy because of his association with Islamist beliefs (his wife wears the Islamic headscarf). It was unclear as Global Finance went to press whether Gül, emboldened by the election results, would stand again for president. Turkey’s EU entry is also strongly opposed by member states such as France and its newly elected president Nicolas Sarkozy, and most analysts do not expect Turkey to enter the EU until the middle or end of the next decade, if at all. Svedberg believes Turkey has a lot to offer the EU, as it boasts a much younger workforce, which could help solve a potential labor shortage in the rest of Europe. “After the Ukraine, Turkey is also the most important energy bridge in Europe,” says Svedberg. There are also “a lot of open issues” pertaining to the EU entry of Balkan countries such as Serbia, which is not expected to join the EU before 2015. UniCredit described Serbia’s GDP growth of 8.7% year-on-year in the first quarter of this year as “impressive,” pointing to exceptional growth in the construction and services sectors. It has also successfully reduced inflation from double-digit figures two years ago to its current level of 5%. Yet, like other transition economies, Serbia has a high current-account deficit (expected to widen to 14% of GDP this year). “Economic imbalances,” particularly on the fiscal side where public spending has increased, were cited as the reason for ratings agency Standard & Poor’s reverting from a positive to a stable outlook for Serbia’s long-term sovereign debt credit rating. Notwithstanding these factors, Serbia has a potentially strong privatizations pipeline, and Svedberg says the stock market has performed “fantastically” this year, particularly in the banking sector. However, the unresolved issue of Kosovo continues to cast a shadow over Serbia’s EU entry and could incite political tensions across the region. Investors seeking opportunities in Eastern Europe are looking beyond the EU candidates and potential accession candidates. The latest CEE Banking Study by UniCredit notes that with fewer privatization opportunities in the established CEE countries, international investors are slowly moving eastward toward Russia, Ukraine and the Commonwealth of Independent States (CIS) countries. From 2007 to 2009, UniCredit predicts Russia and the Ukraine will account for 60% of its new banking business volumes. “Huge sectors of the population remain unbanked in Russia and the Ukraine,” says Debora Revoltella, CEE chief economist at UniCredit Group, pointing to dynamic growth both on the corporate and retail banking sides. Retail loans in Ukraine and Russia are projected to grow by 62% and 52% respectively, double the rate achieved by the CEE market as a whole. On track: Croatia is set to join the EU by 2012. Although concerns remain about Russia’s over-reliance on the energy sector, Svedberg says that the economy is beginning to diversify and that banking and power utilities are good examples of lucrative investment sectors. Yet despite 20 years of reforms, Russia’s transition to a fully-fledged market economy is far from complete. “Significant restructuring of infrastructure and production is needed,” says Gintaras Shilzhyus, a CEE analyst with RZB. Some also point to president Vladimir Putin’s recent intervention in economic issues, which may prove counterproductive—although at this stage foreign investors appear to have forgiven Russia for all its sins, with foreign investment inflows totaling $24.6 billion in the first quarter of 2007, 2.8 times the amount of foreign investment in the same period last year, according to Russia’s state statistics service, Rosstat. 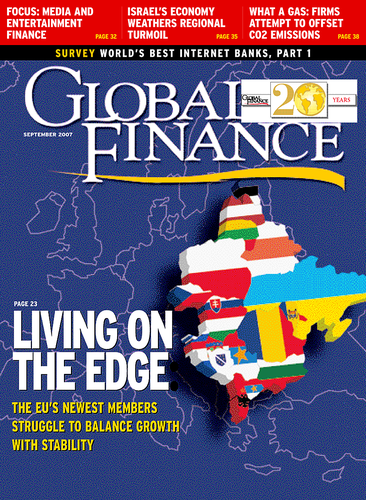 Ukraine is also attracting foreign investors, despite ongoing political uncertainty. Svedberg says tensions between the Our Ukraine Party and the Party of Regions have caused foreign investors to tread cautiously, particularly when it comes to the uncertainty surrounding privatizations and the re-nationalizing of companies. Despite FDI taking a hit, Svedberg says the stock market is performing well: As of July 30 it is up almost 120% so far this year.